Two AdSense units must not be within 1 – 2 Inch proximity on Mobile. That is they say in complicated way. On mobile device two Ads must not be visible together. First AdSense unit must not be a rectangular unit on Mobile. Bigger Rectangular AdSense units may not be “legal” on Mobile. No AdSense units on 404 Page. Google AdSense responsive ad units no way solve the problems. In easy words, using Google AdSense responsive ad units is not a defence to policy violation (yeah, it sounds odd). Furthermore, there are technical problems on WordPress – when posts, pages are cached, PHP logical work may not work i.e. static webpage can be served. Google AdSense usually catch policy violation if some click happens. Actually we were unknowingly violating “No AdSense units on 404 Page” for the past 5 years for one unit (top leaderboard). As our layout is common in WordPress, probably you need not to work huge. That data-ad-format="auto" is safer for mobile devices over data-ad-format="horizontal". Now you need to deliver the units rightly for right devices. So essentially you have 2 different ad codes. We talked about Ad Injection plugin. Ad Injection plugin is a free plugin and can inject raw PHP code – caching with W3TC or WP Super Cache will not hamper the unit delivery if you use correctly (you should always check yourself from various devices). This Article Has Been Shared 5617 Times! Schema.org for WordPress is nicely integrated by Genesis 2.0 but in terms of semantic complexity, it requires some advanced hand made tweaking. Android app can be created for your own Wordpress blog in easy steps without the knowledge of a single piece of coding. Loading WordPress Backend Faster is a dream to many. Somehow if they can manage the Frontend to load faster, the backend remains badly slow. Here is a guide! We Can Add Any PHP Feed Aggregator Snippet in Our Example WordPress Dashboard Widget’s Source To Get WordPress Dashboard Widget Custom Feed. 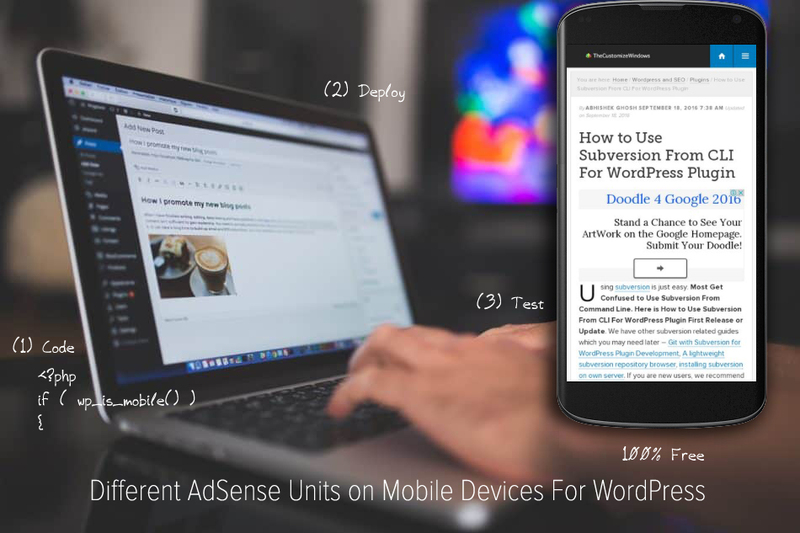 Cite this article as: Abhishek Ghosh, "WordPress & PHP : Different AdSense Units on Mobile Devices," in The Customize Windows, October 15, 2016, April 25, 2019, https://thecustomizewindows.com/2016/10/wordpress-php-different-adsense-units-mobile-devices/.